Recently, while at a family gathering, my five-year old nephew asked me to slice an apple for him to eat. “Of course,” I said “which apple would you like?” He handed me the one he wanted and followed me into the kitchen to watch me cut it. Apparently it was necessary for him to be involved. Dragging one of the dining room chairs over to the wooden cutting board which rested on the counter, he propped himself up on his little knees to make sure I was going to do it right. “Do it the mommy way,” he said in a sweet yet commanding tone. I interpreted this as, “if you don’t cut it the way my mom cuts it, I’m not going to eat it.” Already sensing his complete lack of faith in me, I proceeded insecurely. Now that he was five the simplicity of my presence was no longer enough to win his love and affection. Hugs were no longer free. I had to do something cool. Forgetting that I was a competent and worldly young woman, all of my self-worth was suddenly lost to an apple. Holding the knife hesitantly in my hand, I asked him, “so how does your mom cut it?” “um, well, she” but before he could finish my hand began to move and I started cutting. I sliced the apple in half, then sliced each of those in half, then sliced each of those in half making six slices altogether. Finally I carved out the seeds and core from all six pieces. “yeah, that’s it!” he said with such delight and surprise. He looked at me mystified, almost skeptical, that I knew how to cut it the exact way his mom did. Of course I knew how to cut it the way his mother did, we both learned how from our own mother, his grandmother. Forgetting this when he first asked me, instinctively I soon realized that there could be no other way his mom would have cut an apple. When I was growing up the way my mother cut fruit was everything; there was no other way and it was the best way. From my kid perspective my mother did everything perfectly, like cutting apples and peeling oranges. The grace and skill with which she wielded the knife was mesmerizing and I loved watching her just as my nephew watched me. She had special powers that I came to trust and depend on. These skills were a promise of safety against an unknown world; they were as comforting as being tucked in at night. As I got older I came to realize that everyone has their own way of cutting fruit. Everyone learned how to do it from someone else and some of their ways were even better. I never liked realizing this though; It always had a way of breaking the spell. The spell of safety created by knowing exactly how to do something. Year after year the world keeps opening wide and showing me that there are infinite ways of doing everything. I’m getting more comfortable with this now and even enjoying it but sometimes I long for the simplicity and surety of my mother’s way. This is what growing up is I guess; peeling back the layers and discovering what works for you and what doesn’t. You keep one way of doing something that you like and discard another that despite being passed down to you with great care and love, no longer works. I put the apple slices in a bowl for my nephew and he ran off with them smiling and looking pleased. I could see in his face that it was so much more than just the apples he was happy about. I smiled and savored those sure-footed feelings with him. 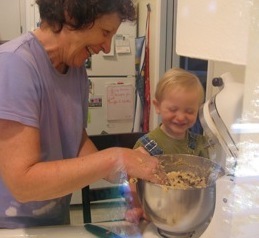 Ben and Grandma in the Kitchen.